Are canned goods and soup cans taking up a little too much room in your pantry? If so, then you must check out this creative solution on Then She Made. 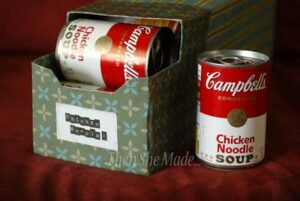 It’s a great way to recycle cardboard plus clear up the clutter in the pantry with this Soup Can Storage! I should do this. Thanks for sharing!